Trikes take up more space than bicycles, at least more width. 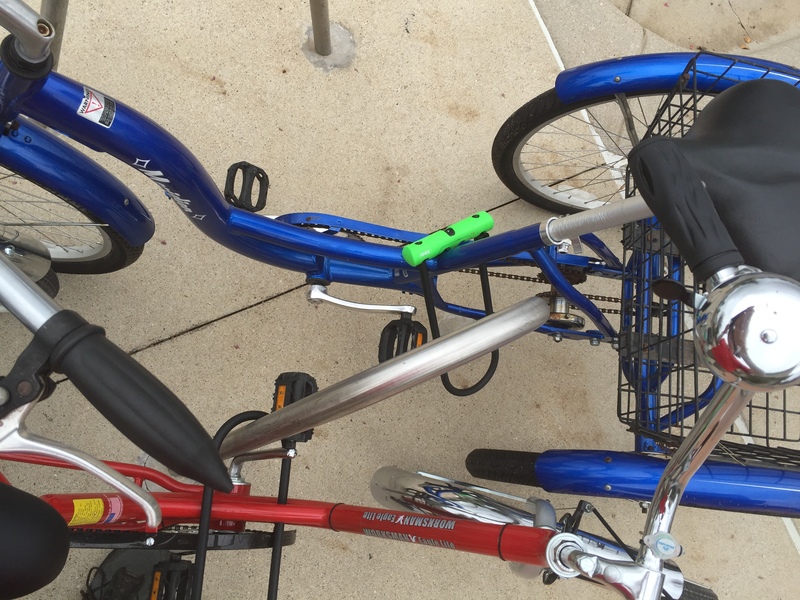 Finding a good place to park and lock a trike can be a little challanging but we have found some tricks that make trike parking easier. Standard spacing for the standard inverted U racks is just a little tight for parking trikes. 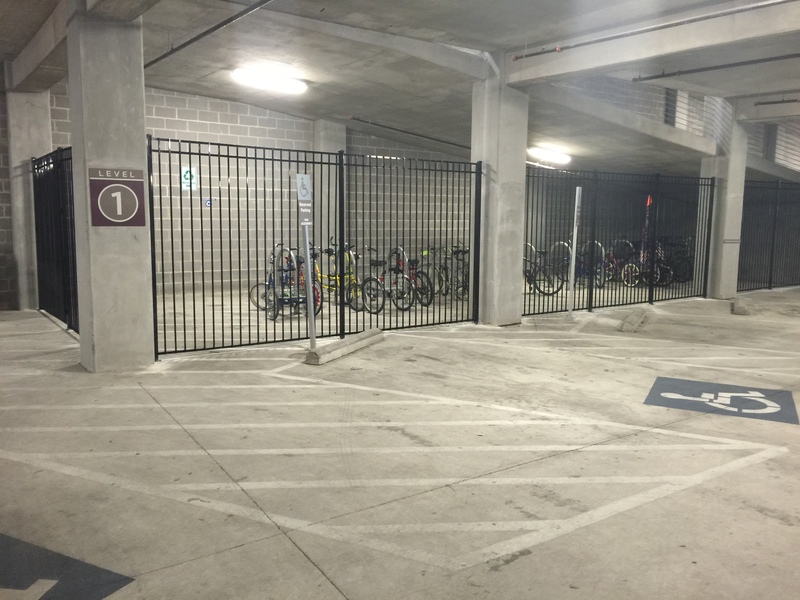 The Association of Pedestrian and Bicycle Professionals has published guidelines on the best practices for bike parking. Regular bicycles are generally take up a 6 foot by 2 foot space. That gives spacing between inverted U racks of 24 minimum to 36 prefered. In addition to spacing, the height of the inverted U should be considered. Many racks are too tall and interfere with the handlebars of trikes. Because trikes are heavier and harder to move sideways than bicycles, being able to move directly into and out of a parking space is preferred. 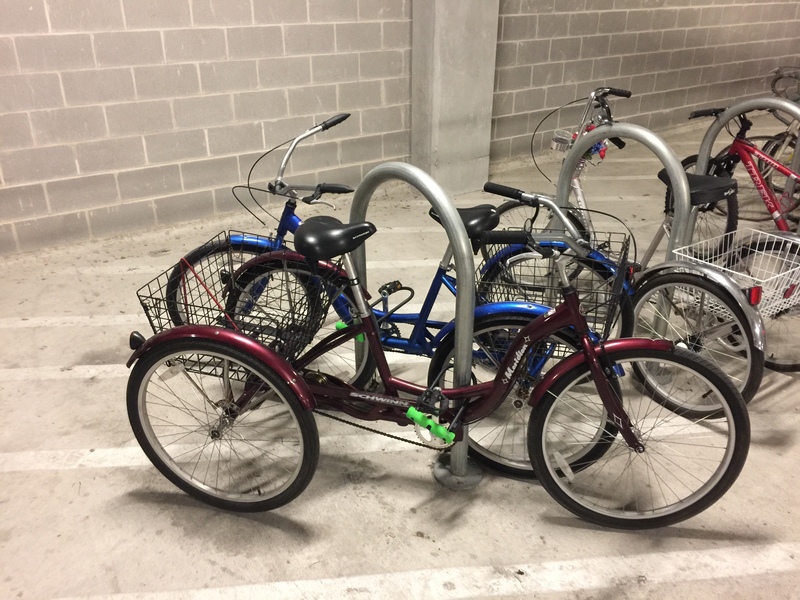 Here are two large adult trikes parked on one inverted U rack. Note that the back wheels are beside the rack and the front is angled to be able to lock the frame and a pedal to the rack. This seems to take up the least amount of space and allows other racks to be used as well. These racks are too tall and interfere with the handlebars causing some effort to get the trikes into place. It is possible that angling the inverted U racks at about 45 degrees would allow the trikes to park straight in reducing the skill necessary to park. Here is a pair of trikes parked at a little different angle but with the same result. Locking on this rack was done nearer the back wheels with the back wheels inside the rack. Using a cable lock for long term storage is risking the loss of the trike. A U lock is a better choice if it is placed so it is difficult to get something into the opening to pry the legs apart. We like to include the rack, the frame and a crank arm if possible. In the photo below you can see a good arrangement. Long term parking should be inside. If you don’t have a storage space large enough and have to park in a public infrastructure then it is important that there be multiple levels of security. 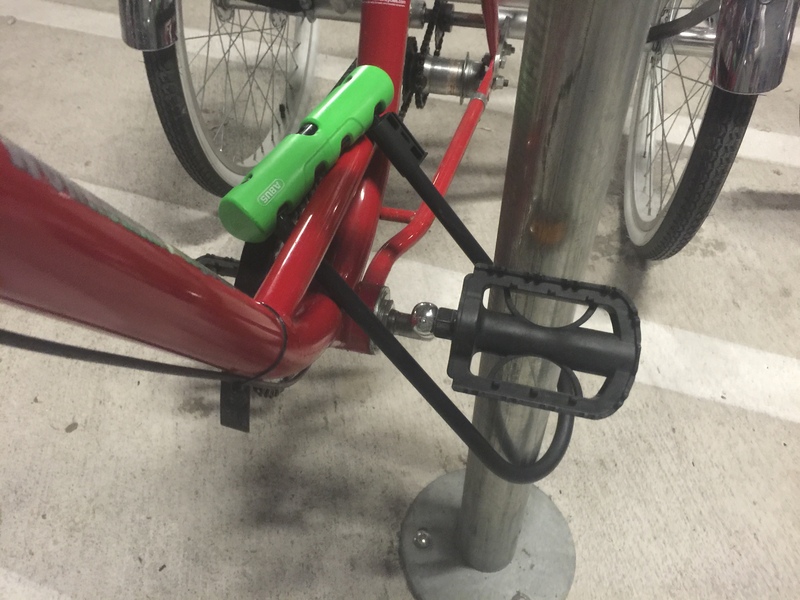 Video cameras that are monitored, a locked cage around the area and individual U locks on the bikes with solid inverted U racks generally cause someone to find an easier target. Finally, when you want to secure your trike while you run into a restaurant or museum for a little while. 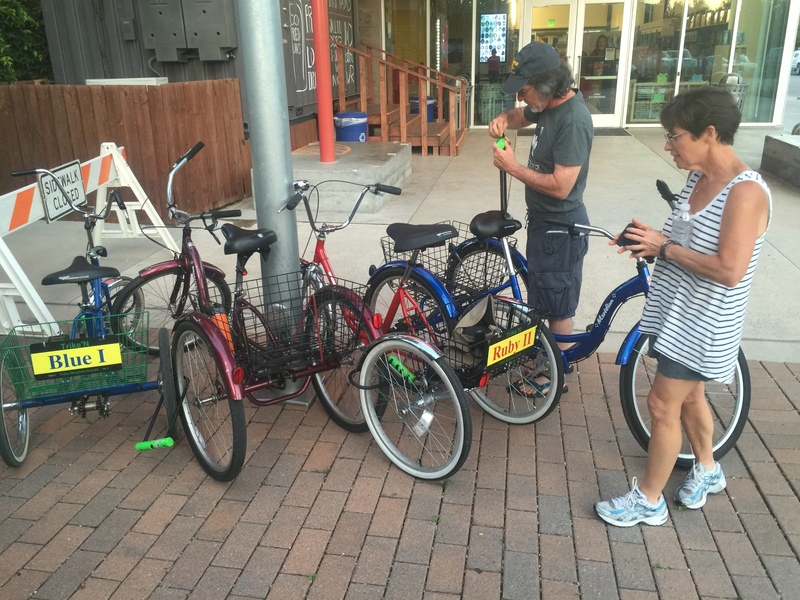 Look for a place where people can see the trikes and then lock them the best way you can. Here is a picture of four trikes locked togeher around a light pole. Locking the wheels together is not the best practice for long term storage but it works for a quick run inside. Take care of your trike and it will take care of you.